Clinching over 70 “best airport” awards over the past 20 years, Hong Kong International Airport (HKIA) is widely regarded as one of the world’s finest airports. It is connected to 220 destinations, including 50 in the Mainland, through around 1,100 daily flights by more than 120 airlines. In 2017, HKIA serves over 70 million passengers and over 5 million tonnes of cargo and airmail. It is ranked the world’s busiest cargo airport for eight consecutive years, and the third in terms international passenger volume. Safety is paramount and we always put priority on safeguarding the safety of passengers and the airport community. Each year, HKIA conducts more than 100 drills, exercises, trainings and seminars covering a number of operational disruption and emergency response scenarios, including security issues, severe weather conditions, system failures, equipment malfunctions and public health incidents, etc. In addition, the annual full-scale aircraft crash and rescue exercise provides opportunities for the airport community, Government agencies and other related organisations to familiarize themselves with and practice cooperation in emergency procedures dealing with an aircraft accident. Typically, over 1,000 representatives from over 100 organisations and Government departments join the exercise. Meanwhile, HKIA uses big data and other latest technologies in different facets of airport operation, including safety performance on runways. HKIA has started using image analytics to help with runway lighting inspection. In the past, it used to take workers a week to inspect all the lights on the runways. Now, a vehicle attached with a high-speed and high-density camera could capture images of the runway by moving along the runways at night. An image analytics software then compares the images captured each night and identify defects on the runway lights immediately. The whole process can be completed in 20 minutes. Other big data pilot projects that are planned for implementation or under study include predictive maintenance of baggage system, building energy management analytics, and runway inspection by drones. HKIA has been very active in embracing new technologies to upgrade the airport facilities and services, providing an efficient and convenient airport experience to passengers. HKIA has developed an operational modelling tool to forecast and simulate the daily operational flow and peaks of the baggage handling system. This enables the baggage handling team to better predict the peak load and usage of different components, such as the early bag store, baggage sorters, and arrival reclaim carousels, throughout the day. The benefit is more dynamic resource allocation through advance planning, resulting in improved efficiency. Moreover, baggage handling robotic arms, called [email protected], are also adopted in back-end operations to improve operation efficiency. A video-analytic-based trolley management system was introduced in 2017, which facilitates the timely recirculation of the 13,000 baggage trolleys at over 100 passenger pickup areas. Since the introduction of the system, HKIA ensures that baggage trolleys are ready when and where people need them. Travellers has no obstacles to find and use baggage trolleys particularly at the baggage reclaim hall. In 2017, HKIA introduced an advanced, common-use self-service kiosks which enable passengers to check in and print boarding passes and luggage tags. This cloud-based mobile kiosks could be rapidly and easily deployed and relocated for travellers to check themselves in, or by airport staff to provide full service operations. HKIA has established our first mobile app, HKG My Flight, in 2016. The HKG My Flight mobile app is central to the digital offer, providing end-to-end airport information and services for travellers, including real-time flight status updates, as well as transport, shopping and dining information. The app can alert passengers about their current location in the airport, and time needed to get to their boarding gate by the fastest route. The app also provides augmented reality wayfinding and signage translation. HKIA is committed to the sustainable development of both the airport and the community. In March 2018, HKIA has received ISO14001:2015 certification. HKIA takes an airport-wide approach to managing our environmental impact. HKIA has created a carbon reduction benchmarking scheme, established technical working groups to share new technologies and introduced an award programme that recognises top performers. In daily operations, HKIA promotes wider use of electric vehicles in the airside areas of HKIA. By July 2017 all airside saloon cars had been replaced with electric models. HKIA is keen on nurturing the next generation of aviation industry leaders by inception of Hong Kong International Aviation Academy (HKIAA) in 2017. HKIAA offers a range of courses and gives airport employees career advancement opportunities through on-the-job coaching and onsite training. HKIAA also facilitates the development of aviation talent outside Hong Kong. In 2017, it partnered with the world-known École Nationale de l’aviation Civile to organise an advanced master’s degree programme in air transport management. Based on the concept of creating shared value, HKIA has rolled out programmes targeting working youths and ethnic minorities, providing career opportunities at the airport. HKIA also subsidises a programme which provides after-school service for primary school students whose parents work at the airport, relieving them from the pressure of staying home to take care of their children. To promote a family-friendly working environment, AAHK established the Airport Preschool for airport staff’s children under the age of three. As for the strategic initiative of enhancing temperature-controlled cargo handling capability, HKIA successfully obtained the relevant accreditation and was recognized as an IATA CEIV Pharma Partner Airport in July 2017. In strengthening HKIA into a high-value air cargo hub, a premium logistics centre in HKIA’s South Cargo Precinct will be developed to facilitate express cargo growth driven by e-commerce. With warehouse space of around 380,000 sq.m., the centre will be one of the largest logistics facilities in Hong Kong. It will be equipped with innovative features to serve the e-commerce, temperature-controlled airfreight and transshipment segments. To meet growing air traffic demand, HKIA has rolled out development plans to increase capacity, and invested in facilities upgrade and new technology to enhance efficiency and service quality. HKIA is expanding from a Two-runway System to a Three-runway System (3RS). The 3RS, which involves reclaiming 650 hectares of land, and building a 3,800-metre-long runway, a new passenger terminal with 57 parking positions, a new automated people mover system and a baggage handling system, is one of the largest infrastructure projects in Hong Kong. 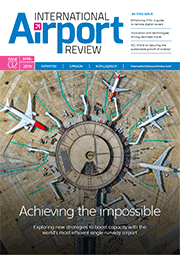 The 3RS is crucial in supporting air traffic growth at HKIA and Hong Kong’s long-term development. The project is targeted to be completed by 2024. The Midfield development project includes a 105,000-square-metre, 5-level concourse, 20 parking positions, and the extension of the automated people mover (APM) system connecting the Midfield with Terminal 1. The Midfield Concourse was in full operation from March 2016 which HKIA is able to handle an additional 10 million passengers each year. In mid-2016, HKIA began expanding Terminal 1 to introduce more modern facilities and friendly services. This projects include the construction of the Terminal 1 Annex Building on a site north of Terminal 1. The annex will offer additional check-in, baggage reclaim and security and immigration facilities plus a variety of dining outlets. Other facilities such as seating, carpets and washrooms are being refurbished. The boarding gate area will be transformed into themed zones to create a more relaxing and fun ambience. HKIA unveiled plans for SKYCITY in October 2016. Situated at HKIA, adjacent to the passenger terminals, SKYCITY is a 25-hectare integrated development comprising retail, dining and entertainment facilities, plus offices and hotels. With its strategic location, SKYCITY will benefit from traffic flows from the 3RS, the Tuen Mun–Chek Lap Kok Link and the Hong Kong–Zhuhai–Macao Bridge.